Now that Winter is (hopefully) nearly over we can look forward to visits from family and friends in the coming months. It looks like a busy time ahead with Daphne and Johnny due to arrive tomorrow – together with the chimney sweep, who was supposed to come on Tuesday morning but he rang at the last minute and changed his rendezvous to Friday. Oh well, it saved me worrying too much about (not) dusting the living room. Bear is suffering from a bad back. Something clicked when he lifted the toilet seat, and he can hardly move without yelping in pain. I’m also concerned about his driving now that I realise how bad his eyesight is getting. We went to the opthalmologist last week and I was stunned to find that he couldn’t make out a rather large E – he thought it was a square. It means that I’ll have to pluck up the courage to take the wheel when we go out with Daphne and Johnny. He drives all day at work and doesn’t like driving during his holiday. However, if my driving makes him nervous he’ll have to take over. After two days of almost Summer temperatures – 21 degrees – it has turned cold again. 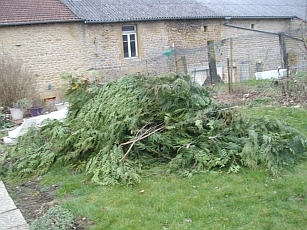 The short burst of enthusiasm for gardening has been blown away by the chill wind and so there’s no hope of clearing the enormous pile of branches in the middle of the garden – which is all that remains of four conifers – before our visitors come. It was a shame to cut down the trees but Willow, our youngest and most agile cat learned how to climb up them and jump over into Claudine’s garden. The only problem was that it wasn’t so easy for her to get back and it meant going next door to rescue her. I don’t like the idea of chopping down trees withut replacing them so I’ve bought two more fruit trees. Hopefully I’ll be able to get two more next year. At Easter we’ll welcome Rosemary and in May Wendy is coming over with her husband, son and his girlfriend so that means I’ll see all three of my sisters. In June we’re expecting a friend of Jay’s from America and in July a friend of mine from college days and our friends from Norfolk who come every year (but not all at the same time). It will be lovely to see them all but I may be ready for a ‘holiday at home’ in August.